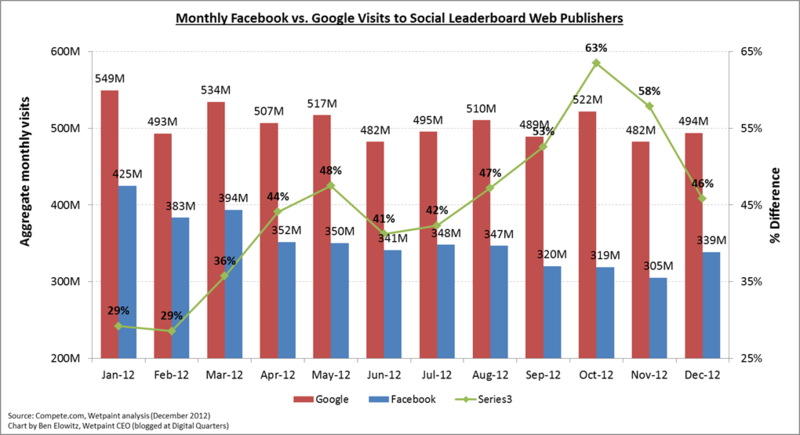 After a long spell of stagnant growth, Social Leaderboad numbers showed a welcome, albeit modest bounce in the final month of 2012. Compared to the anemic (0.1 percent) overall increase from October to November, 2012, the Leaderboard finished the year up (a less anemic) 0.6 percent. That’s a far cry from 2011’s November-December 17% leap in traffic from social, but we’ll take what we can get. And a few web publishers finished the year in a sprint. Buzzfeed rode a holiday spike, more than doubling its December social traffic, from November’s 15.6 percent to 34.1 percent. Wetpaint’s more modest 4.1 percent increase nevertheless led to a record 49.5 percent mark in traffic from social for December. Other end-of-year Leaderboard results were less dramatic, but trending generally upward. MTV and People continued to swap Leaderboard spots, with MTV taking the #3 position in December on the back of a 2.8 percent rise in social traffic. (People finished fourth with a 0.8 percent December bump.) NFL and NBC also posted positive gains (of 1.3 percent and 1.2 percent, respectively). In contrast, its 0.1 percent December dip knocked TMZ.com out of the Leaderboard’s top five for the first time since last September. If you factor out the portals and a major CBS boom (more on that in a sec), the total social traffic was up by an average of 200,000 visits in December to each of the top 50 content sites on the web. Huffington Post and CNN.com remain the Leaderboard’s Hertz and Avis when it comes to total social. Both were up 0.7 million from November. As for CBS.com, its social traffic according to Compete.com, grew dramatically in December—up 4.6 million social visits over its November total and leaping from the #8 to the #3 spot on the Leaderboard, right behind CNN. Would love any tips on what is driving the surge, with traffic to CBS.com from all sources up nearly 200% from November. Although Wetpaint recorded 0.1 million more social visits in December, it slipped a notch in the rankings (from #5 to #6); while still outperforming People by 0.9 million visits. Meanwhile, Buzzfeed jumped eight positions (from #15 in November to #7) on the strength of a 1.8 million increase in total social traffic for December. Facebook traffic to web publishers rebounded from its November doldrums. Referrals were up 11% over November. The 339 million December visits are well below January 2012’s 549 million high point, but much better than November’s 305 million low. Google still sends 46% more traffic to web publishers than Facebook. The gap narrowed from November’s 58% finish, thanks to the portals (AOL, MSN and Yahoo), which collected 22 million more visits in December. And the 2012 Media Awards Go to . . .
Best Job Squeezing Blood from Rocks: Hulu. The video service gets consumers to actually pay for that which all consumers expect to get for free—and makes itself successful in the process. Great content and a great user experience keep Hulu’s subscription business cranking strong. Now, if only it can survive the departure of CEO Jason Kilar and the animus of its principal owners (Disney, Comcast and NewsCorp) who are, after all, uneasy competitors. Best Reanimation of a Zombie: Yahoo. A cultural reboot courtesy of new CEO Marissa Mayer gives the tired portal some speed (up from zero), while a new demand for fast-paced decision-making raises the bar on time to market. With COO Henrique DeCastro’s focus on the things that will move the needle the most for the company, they have a serious shot of getting some quick success – even if the odds of any massive turnaround like this are inherently long. Continually tweaking the Kindle, faithfully chipping away in the video arena. These guys are indefatigable and relentless when it comes to achieving their most important goals. They get a little bit better every quarter, and it compounds to mean the are making a lot of progress. Most Aggressive: Hubert Burda Media. Full disclosure: Hubert Burda is a Wetpaint partner, so I’ve gotten to know them closely. But of all the offline-rooted companies I’ve spent time with, Burda is singularly fearless about making a strong and swift transition to digital. They’re not on everyone’s radar here in the U.S., but this $2.5 billion-plus German publishing powerhouse has been aggressive about exploiting not just advertising, but subscription, commerce, licensing and other revenue streams. It’s a smart way to run the portfolio. Not the best year for the social media giant, with its disappointing stock debut and ongoing monetization crisis. But Facebook gets my Spaghetti Award for its willingness to throw all kinds of monetization ideas at the wall to see what sticks. Think Reach Generator, Promoted Posts, Facebook Exchange, Facebook Gifts, Paid Messages, Sponsored Stories (in user newsfeeds and mobile) and most recently an announcement—then a recall—of its off-property AdSense equivalent. I get tired just listing all those initiatives. Facebook hasn’t abandoned creativity or quality in its quest to monetize. But it has left other initiatives—Open Graph and Social Reader, for example—in limbo. I wonder whether its standing as a platform among publishers, partners and users can recover when Facebook decides to resurrect those priorities down the road. Give ‘Em What They Didn’t Know They Wanted: Apple. Duh! Apple continues to rule the industry by seducing consumers with novel experiences. That is Apple’s secret weapon, and it gives them the market power to earn more growth in media than pretty much anyone else out there. Even with the maps debacle and the struggle to manage without Steve Jobs, 2012 unleashed yet another wave of Apple products that wowed consumers and guaranteed their loyalty and—especially compared to Android—downstream spend. There were lots of iPhone5s, iPad Minis, new slimmed-down iPod touches and nanos, and other Apple gizmos sitting under Christmas trees last year. 2012 didn’t exactly dazzle, but it didn’t fizzle either. I head into 2013 with an open mind, but here’s what I’m keeping my eye on for next January’s list. Facebook: With search and monetization the clear priorities, will Mark Z put content back on the front burner? A long shot, yes. But if a novel strategy can strengthen connections between users and content they love—and yield better search results in the bargain—the pendulum may start swinging back content’s way. Yahoo: Marissa has Yahoo’s re-animated product groups marching to her techie tunes. Now she needs to reinvigorate Yahoo’s media properties. It won’t be all of them, and they won’t get as much love as search, but to succeed with display advertising, Yahoo needs to invest in its media properties and its users. Magazine and newspaper publishers: Mobile apps generated modest revenues in 2012. With more app publishers looking for more ways to wow consumers—and charge for it—2013 revenues could take off. Publishers will need to focus on what really hooks consumers and upgrade the experiences they offer, not to mention changing their cost structure. Digital media companies: Will the pure-plays’ platforms perform? Startups are set up to build structural advantages, not just publish content. When they succeed, the new platforms can be secret weapons of choice for digital success—and not just for the startup. Look for startups to leverage their technical chops into partnerships with major media providers who need some tech magic when it comes to content selection, creation, distribution, audience loyalty and more. For the old giants, most know they can’t build all-new platforms; they need to partner or buy. The upside for the upstarts? A chance to break into new levels of scale. This article was published as a guest post at AllThingsD, and is republished here for Digital Quarters readers. In August 2011, I went out on a limb about Facebook’s strategy for search. Search is a feature every Web user needs—and by knowing its users so well, Facebook has some incredible and unique ways to change the game. 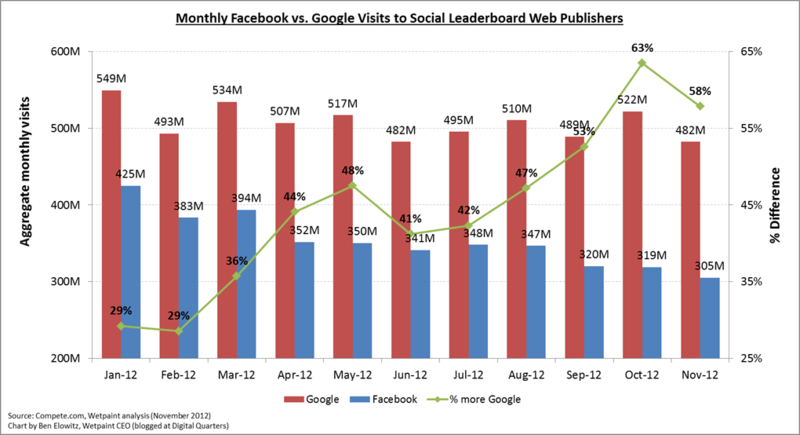 But at the same time, it would be a losing proposition for Facebook to compete head-to-head with Google. Still: I predicted Facebook will enter search by the end of 2012. As the news bore out on January 15, 2013, I was off by two weeks. As close as that timing was, when it comes to how they will enter, I was dead right: Rather than going head-to-head with Google, I said it would focus exclusively on where your graph is far more valuable than even the best redux of the entire web. 1. Keep expectations low. If there’s one thing Facebook hopefully learned from its IPO, it’s that it’s far better to set expectations low and exceed them than to sell high and disappoint. Any user who types a day’s worth of typical web searches into Graph Search is going to walk away with one conclusion: Facebook’s new product is terrible at most of the things that Google has taken 15 years to be great at. Users who have a bad experience rarely give you a second chance. 2. Meet users where they are. One huge red flag is Facebook’s bent to “diseducate” users from their “bad search habits.” Oh, the attitude of it! But worse than attitude, it’s a bad recipe. Consumer products and Web services have taken off by presenting people with experiences they love, and offering an interface that they like and naturally adapt to. Facebook needs to adapt to its users’ searches, not the other way around. 3. Reopen Open Graph. Back in September 2011, Facebook came out guns blazing, ready to work with the rest of the Web to fill in the graph with more user information, connections, and actions. At the time, the promise was that websites and publishers who connected to the graph would give Facebook great information, and get Facebook viral traffic love in exchange. But unfortunately, with its decisions to pull back from social readers and so-called “frictionless sharing,” Facebook dropped its end of the bargain, and most publishers and other sites have given up on it. The catch now is that Facebook needs that information desperately—or else far too many searches will come up empty. Facebook needs to reconnect with the rest of the web—and if it doesn’t, then Graph Search will quickly hit a ceiling. 4. Give users a great reason to participate. One of the reasons that Open Graph didn’t go so well for Facebook is that users wanted out of their own unbalanced equation: Facebook got greedy and started posting users’ actions on the feed—whether the users wanted it to or not. What it forgot to do was work on the “WIIFM”—what’s in it for me? In the new world of Graph Search, it’s clear that my “likes” benefit my friends and friends of friends. But Facebook needs to come up with better experience enhancements that will help me. The good news is that search can open up a whole world of possibilities. The restaurant I just found on Facebook desktop search should be primed for navigation directions on my mobile—and then as a check-in destination when I arrive. Whether it’s a like or another action, give me reasons to tell you what’s important. 5. Expand the wedge. Developing Graph Search couldn’t have been easy — even in its initial builds that have supported relatively specific and small sets of queries. But the key to whether it succeeds will not be in which searches it works well for at launch, but rather the rate at which that set expands. Facebook just inserted the “thin edge of the wedge” into the search pie. Now it needs to steadily—daily, weekly and monthly—expand that wedge by becoming more and more useful. That kind of frequent improvement is exactly what cemented Google’s position, and it’s what will allow Facebook the opportunity, over time, to take it over. Facebook has a huge opportunity in search: Whereas Google competes in search by understanding your intent, Facebook can do so by knowing you personally. For Facebook, search represents a monumental opportunity to increase usage, reassert its relevance to users who have burnt out on the service, and grow its business. But it will require thoughtfulness in how it develops and introduces the service in order to achieve it. Is social going to drive more traffic than search? At the beginning of 2012, it seemed like the answer would be yes. But over the last few months, we’ve hit a flat spot. Traffic from Facebook and Twitter to top web properties has leveled out. In fact, I decided to spare you the October Leaderboard results and skip right to November, which shows an average change of (wait for it . . .) 0.1% over October. What’s going on? First, as many of you know, Facebook was all guns a’ blazing about Open Graph at this time last year. But in the reckoning that followed its shaky IPO last May, the company’s attention seems to have been all but pulled from that strategic initiative and focused instead on monetization. With that shift in emphasis, Wetpaint’s analysis of overall clicks sent by Facebook to the top 50 publishers on the web shows a significant decrease (more on that below), corroborating the impact—noted by others—of Facebook’s algorithm changes. But the second nuance is more interesting: The algorithm change hasn’t effected everyone equally. It turns out the change has reduced tons of impressions in the newsfeed that users weren’t clicking on. And that translated into less traffic for portals. 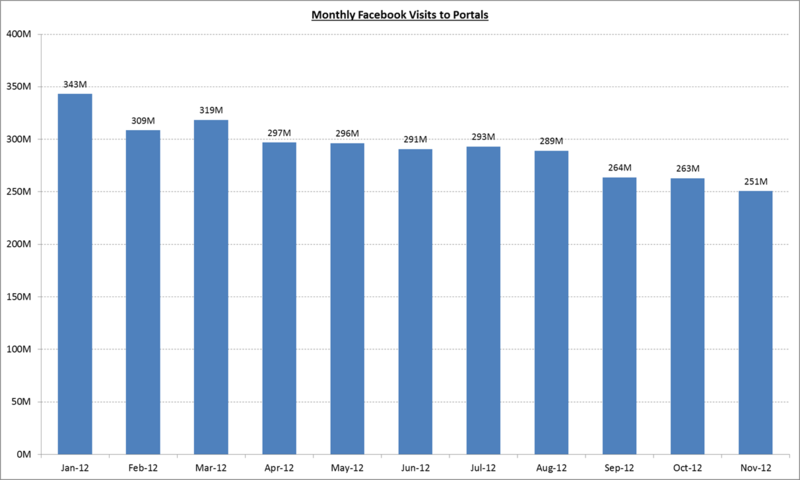 In fact, referrals from Facebook to the portals have been declining steadily since April. In the meantime, the latest month’s results show that despite those changes, the average amount of traffic from social for the 50 largest web publishers remains almost exactly the same. At 18.5 percent, Buzzfeed is the only one of September’s Top Five Leaderboard finishers to post a substantial gain in social composition for November (1.8 percent). Wetpaint finished October at 47.4 percent—a 2.7 percent increase over September’s performance—but slipped back to 45.4 percent in November. MTV fell 1.6 percent from October and lost almost five percentage points since September, dropping it from third to fourth place in Leaderboard standings. The decline put the network back behind People, whose social composition traffic also fell in November, but by a much smaller margin (-0.7 percent). Rounding out the Top Five is TMZ.com, whose 8.2 percent November finish represents a -0.1 percent change from September. When it comes to total traffic from social, Huffington Post and CNN.com continue to lead the pack. Both saw gains in November. So did FoxNews.com, which moved from its #4 September finish to #3 thanks to a 0.5 million bump in social traffic. With 3.5 million social visits in November, Wetpaint improved its standing too, moving from its #7 September slot to #5, which put it ahead of People for November. NFL.com lost some ground in November, dropping from its #3 September spot to #4. Meanwhile MLB.com, with its 2012 season over, fell deep in the rankings, dropping from its #5 slot in September (with 2.8 million social visits) to #16 for November (with an even million). FoxNews.com picked up 0.5 million in November to leapfrog ahead of NFL.com into the #3 position. At 305 million for November, traffic from Facebook fell to its lowest level in 2012, down from a high of 549 million last January. Google registered a dip in November too (from 522 million in October to November’s 482 million mark), but Google has remained more consistent than Facebook when it comes to forwarding traffic to media sites. The top 50 web publishers now get 58% more traffic from Google than Facebook.